Updated 11/3/16: Multiple Satellites are available and supported. My first look at NETGEAR's Orbi in Mesh Mashup Redux - NETGEAR's Orbi Checks In concluded it is the best of the multi-unit Wi-Fi systems I've seen so far. But since that review focused primarily on only one aspect of its performance, it's time to take a more complete look at Orbi. Orbi is NETGEAR's entry in what I'll call the "Wi-Fi System" sweepstakes. But it can't really be called a "mesh" Wi-Fi system because, uh, it isn't. Mesh systems form wireless connections among multiple units (nodes) to move data between an Ethernet connected root node and other wireless-connected nodes. Mesh systems like Luma and eero typical come in three-packs, with one node connected to your internet modem via Ethernet and the others connecting to the root node directly or to each other. Orbi's architecture is more like a conventional router + wireless extender with one key difference. Orbi uses a dedicated 4x4 MU-MIMO radio to connect separate AC1200 class simultaneous dual-band radios in both Router and Satellite. "Mesh" systems like eero, Luma and Ubiquiti Networks' Amplifi don't have dedicated backhaul radios. They use their AC1200 class radios for both backhaul and client device connection. The only exception is eero, which has a shared 2x2 AC 2.4 / 5 GHz Hi-band radio and additional 2x2 5 GHz low-band class radio. All other systems have two 2x2 AC radios, one for each band. So "mesh" competitors have at best a maximum link rate of 867 Mbps to work with and must split that link's bandwidth between backhaul and client. Orbi's 4x4 AC backhaul supports a 1733 Mbps maximum link rate and therefore much higher bandwidth. As we saw in the Mesh Mashup review, this gives Orbi a significant performance advantage, even with backhaul operating in 5 GHz. Orbi could be mistaken for an air freshener, albeit a rather large one, which might limit its WAF compared to the much smaller Luma and eero. But its off-white color, lack of blinking lights in normal operation and absence of an unsightly antenna farm (there could have been eight y'know) will argue in its favor. The Orbi system comes as a kit containing one Router and One Satellite / extender. The callout diagram below shows they're basically the same unit, differing only in the color of the top panel and markings on the rear panel. Both have four Gigabit Ethernet ports, with one doing duty as a WAN port on the Orbi Router. Both have a single USB 2.0 port that has no function right now. Router and Satellite come pre-synced and should connect when you first power them up. If they don't or if you want to set a new password for the connection between the two, aka "backhaul", you'd use the Sync button. This button is also used to start a Wi-Fi Protected Setup (WPS) pushbutton session for connecting devices that support WPS. 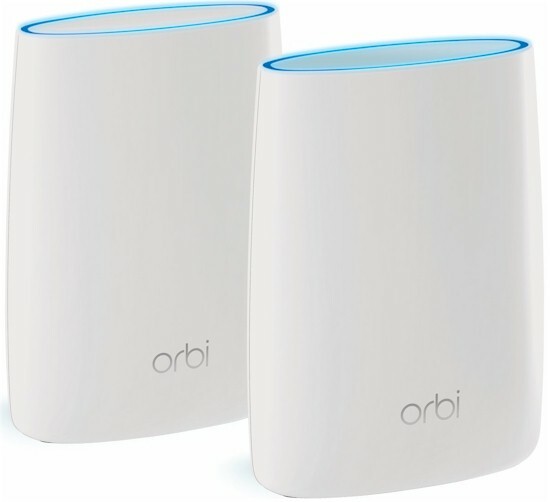 The Orbi Router (RBR50) can also be purchased separately ($250) if you just want an (expensive) AC1200 class router. The Satellite (RBS50) can be pre-ordered now, for late November shipment, but will require new firmware before it can be supported. When that new firmware appears, it's unclear whether additional satellites will form a mesh (communicate with each other) or star (communicate back to the Orbi router) network. Readers report that Costco is selling an Orbi "three-pack" with one Router and two Satellites. There are reports of other retailers, including Best Buy, selling separate Satellites. Two Satellite configurations are reported to work, but only with both Satellites connecting to the Router, not to each other. Firmware v1.4.0.16 adds support for adding additional satellites to the setup wizard. Orbi's FCC inside photos are under temporary non-disclosure until late January 2017. So after testing was complete, I opened up the Orbi router. (Tip to others attempting this: remove all labels!). Orbi is built on a Qualcomm / Qualcomm Atheros platform. In fact, it's the first product to use Qualcomm's SON (Self-Organizing Network) technology introduced this past January at CES 2016. The photo below of the connector side of the board shows the Qualcomm IPQ4019 2x2 802.11 SoC, that supports device connection. The CSR8811 Bluetooth 4.1 radio SoC is photo top center. Its antenna is to the right of the mini RF connector. Note the IPQ4019 supports MU-MIMO. But with only two streams, total throughput improvement may be hard to detect, even if you have at least two MU-MIMO enabled devices. The 5 GHz 4x4 backhaul radio is supplied via a QCA9984 on the other side of the board, which also supports MU-MIMO. This could give Orbi an edge when NETGEAR enables multi-satellite support. This 4x4 SoC also supports 160 MHz channels, although NETGEAR makes no mention of this in any Orbi literature and didn't mention it during the pre-launch briefings. Orbi's internal antennas are worthy of note. I don't know how to describe the design, but they are not the usual bent-metal or PC board designs. Four 5 GHz backhaul radio antennas are at the top; two dual-band device connection antennas are set below them on Orbi's sides. The complete component list is in Table 1, along with eero and Luma. Note that I'm giving eero the benefit of the doubt and listing its 5 GHz only radio as dedicated to backhaul; I'm not sure if that's actually the case. Even if it is, however, eero's backhaul is a 2x2 connection vs. Orbi's 4x4, providing half the maximum potential bandwidth. Orbi also includes a Bluetooth 4.1 radio, which can be used with an Orbi app for setup. The gallery below has more pictures of Orbi in various stages of undress. Other side of the board with case removed. Top with heatsink removed. The device in the peek-a-boo RF can hole is the 4 GB flash module. It connects directly to a block on the heatsink for best thermal transfer. Bottom with RF can tops removed. 512 MB RAM is photo right; 4x4 5 GHz backhaul radio is photo left. Top with RF can tops removed. The Qualcomm IPQ4019 2x2 SoC and 4 GB flash module are photo center. QCA8075 Gigabit switch sits near the RJ45 connectors at photo right. Four 5 GHz backhaul radio antennas are at the top; two dual-band device connection antennas are set below them on Orbi's sides.